Independent studies show a social return on investment of between R8 and R10 for every R1 invested. Education is the broad field that attracts about half of all social investment in private sector community development work. 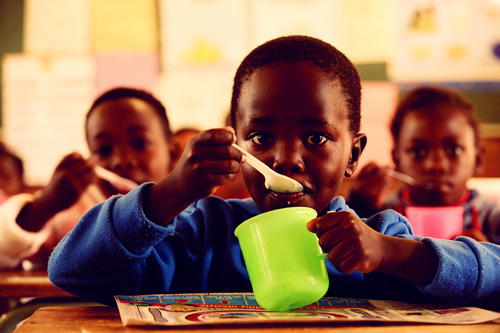 It is therefore particularly important for social investors to see the social returns on investment (SROI) that are achieved through holistic nutritional programmes in schools. The Tiger Brands Foundation thus commissioned Resilience Analysis Consulting to independently verify the SROI of the Foundation’s work through 2016 and 2017, looking at seven Limpopo schools and at five in the Northern Cape. This analysis indicates that the programme delivers an SROI in the Northern Cape of 10.51:1 at least (i.e. for every R1 invested, approximately R10.51 of social value is created), while in Limpopo it delivers a minimum SROI of 8.68:1 (thus for every R1 invested, approximately R8.68 of social value is created). The methodology used in the study was that first developed by the Roberts Enterprise Development Fund in the USA, further enhanced in the UK, and extensively adopted across Australia, Europe, the UK and the US for more than a decade. It is a framework for understanding, measuring and accounting for the broad concept of social value that incorporates social, environmental and economic benefits of the Foundation’s work. In this, the credibility of attribution is a key consideration when trying to measure the effects of social investment. The Foundation therefore requested a conservative approach to measuring any benefits of its work. Stakeholder groups that were identified for the study included learners, most vulnerable learners, educators, food handlers, parents and caregivers, local and provincial educational systems, affected communities, vendors, and associated small businesses. The complex analysis included determining how the Foundation’s theory of change affected each stakeholder group with outcomes for each worked from direct stakeholder engagement and interaction; indicators identified for each outcome; financial proxies assigned to each of the outcomes of value, and the use of a sensitivity analysis for these. Filters were applied to account for those external factors which may have an effect on the overall impact created through the programme. To avoid over-claiming, care was taken to have direct engagement with stakeholder groups; to include in the analysis only those on-the-ground material changes that are obvious; to consider the Foundation’s maximum investments (including branding); to use the minimum number of beneficiaries; to research financial proxies at local level; and to apply filters (deadweight, displacement, attribution and drop-off) at the highest percentage for each stakeholder. The Foundation is heartened at the results of this analysis, underscoring as it does the strong social returns received across stakeholder groups on social investments in nutrition as an essential part of education strengthening.